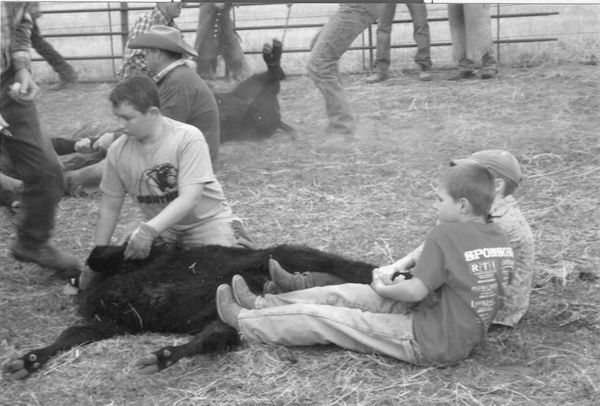 Picture your sons and daughters wrestling and branding calves on a Nebraska cattle ranch: then picture yourself, riding along with them and the experienced calf wrestlers, learning the ropes, enjoying the beefy meals, and the outdoor spaces of the western prairie. We've all had that dream, but for Virginia Ross of Stronghurst, it was a dream come true. It was like a Hollywood movie-lots of stock trailers, pickups, cowboys and horses. And, oh, yes, kids! I never know what to expect when I come to Nebraska, but it has to be one of friendliest states in the United States. They don't know strangers and this was true when we pulled into the Kilmar Valley at the Childears' Ranch with a 4-horse trailer and serious pick-up plus four horses. Nebraska has a cattle branding law and we had come to just for that, a branding. We were not the first group to arrive as already pickups and horse trailers were lining up in a lot east of the ranch house where big round bales were lined out in row upon row. All the Moss family rides so the next step was to unload Stitch, T-bar, Woody and Tupac, throw on the saddles and tie them down to the trailer. What an oddity in this crowd to have a city Grandma who doesn't ride! Going to the house, the Childears met us with ready welcoming smiles, hot coffee and incredible homemade cinnamon rolls. Thus, began the visiting about the day ahead. In the group, sharing stories, etc. were ranchers, their kids and wives, insurance salesmen, land agents and managers, and want-to-be cowboys who owned a horse and probably grew up on a ranch. Oh, the kids had invited a city boy to help (more about him later). After sharing a few instructions, John, the owner, and his sons briefly lined out the cattle's locations and finished with, "Let's saddle up." The group headed for their horses and I snagged a ride with Jarid in his red pick-up (all pick-ups out here come equipped with 4 doors and serious cattle guards on the front end). In the back were several small girls and up front with Jarid was a town teenager who had never been to a branding. As we bounced down a sand lane (it's the Sandhills which is one gigantic sandbox with plants and lots of steep hills) Jarid explained to this city teenager how to catch hold by the hind leg, flop the calf down, position your boot in the right spot (whether right or left leg was involved) and hold on tight. A lot depends on practicing through trial and being kicked to figure out the routine). This young man was game and after stopping for a barbed-wire gap, we were in the first pasture. Parked ahead was a trailer full of gates hanging from a heavy metal T-iron shaped affair. The branding irons and holder, a propane tank and cattle vaccine cooler were on the pulling pick-up. John called us all together to explain to us bystanders what our job was-stand behind the trucks when the cattle came up and then make a human funnel to help guide them into the corral. He kindly knelt and gave special instructions to his small granddaughter. What a touching moment-a tall grandfather down on his knees so this wee one would be part of the group! Over the hill came black and red Angus cows and calves being shepherded along by the horseback crew (29 mounted including kids). Luckily, they went into the corral except for only one wayward calf who had dropped off in a corner of the fence of the corral. With a few encouragements he joined his mama. Cows and calves had to be separated so several gates were positioned into a funnel and two cowboys with sorting sticks ran the outlet while other fed a line of cows in their directions. In no time sorting was accomplished and except for one frisky calf which broke for freedom (he was soon roped and returned to the corral) the job was done and it was time to get down to business-let the fun begin. The brands, holding rack and propane connection where pulled off the pickup and set up to heat. (Each owner has his own special registered brand and has chosen either right or left flank for the branding.) In the meantime ropers and wrestlers were assuming their proper places and Becca was being told how to calibrate the vaccine. The brander grabbed the branding iron, applied it to the top hind quarter for only a few seconds and the calf was swerved to the left/right and released to join his mama in the pasture. Over and over this procedure was followed-rope the calf, drag it through the gap, wrestle it to the ground securely, apply the brand, release to the welcoming bellow of the anxious cow. My job was to stay out of everyone way and help Sierra keep the cows out of the line of action by waving a coil rope and shouting. Even though dark clouds rolled across the sky, only a few welcome drops fell. The Sandhills are beyond dry and ranchers are worried about having enough grass to pasture their cattle. All winter long the only precipitation could be counted as .025 and grass does not grow readily with that amount. In no time at all, the first group was done. The gates were separated and hung on the T-rack trailer, the brands, holder and propane were loaded on a truck, horses were mounted, and we returned to the pickup following the group out of the pasture. We headed for the house where Jarid picked up a five gallon bucket of gravel in which to place the irons between branding to sharpen the edges. Onward to pasture number two and repeat the entire operation except the corral had to set up before cattle could be rounded up. It's the same but never the same-a calf might need an extra shot, a branded calf might escape back into the corral of the unbranded ones (it is left until all are processed and then released), or someone is kicked while wrestling the calf, etc. What really amazed me was that the young children were made a part of the process. The calf was already down on the ground with no way of escaping and then a small child would sit in her dad's lap and position her boot in the right spot. She was learning her future job in about six to eight years later. Out here these ranchers are sharing their way of life so that city people can understand agriculture and where their food originates. They are passionate about how important this is as more and more of the United States population lives in an urban environment and their only contact with food is the supermarket or fast food outlet. And, by the way, farmers and ranchers have been environmentalists all their lives-their livelihood depends on it. After the last group was finished, everyone lent a hand loading the corral, etc. and we all headed for the house where prime rib was cooking on a pellet smoker and homemade salads and desserts awaited the hungry crowd. After a heartfelt prayer, the group of 45 lined up for an entire counter full of great eating, Now, I must praise Maureen's potato salad. If there is the perfect potato salad, she makes it. My deceased sister-in-law used to make one and it had been 22 years since I had eaten any, but Maureen's is just like it! I ate a double helping instead of dessert. Oh, I should mention Marlene's taco salad too. She said it was a new recipe using 1,000 Island dressing and believe me it did not last long. Around round tables the day's events were rehashed, the markets covered and local news discussed. A welcome rain of a few minutes had fallen and everyone was wondering if they had received any at home. What can I say, but this was an event of a lifetime for me. I saw first hand a way of life and met some genuine, good people-what a great way to spend a day. Thank you, Childears' Ranch of the Kilmar Valley, Nebraska.